Nakshatras für die Berechnung glücksverheissender Masse (Ayadi-Masse) für Neubau-Projekte. Die Ayadi-Formeln sind 16 Formeln, welche idealerweise alle positive Resultate liefern sollen und darunter ist die Nakshatra Formel eine der essentiellen Formeln. The perimeter of the primal energy particle, Paramanu was measured and used as proportional base in building’s perimeter (Umfang) calculations. Vastu regulates the primary elements in an enclosure with reference to its length, breadth and height. 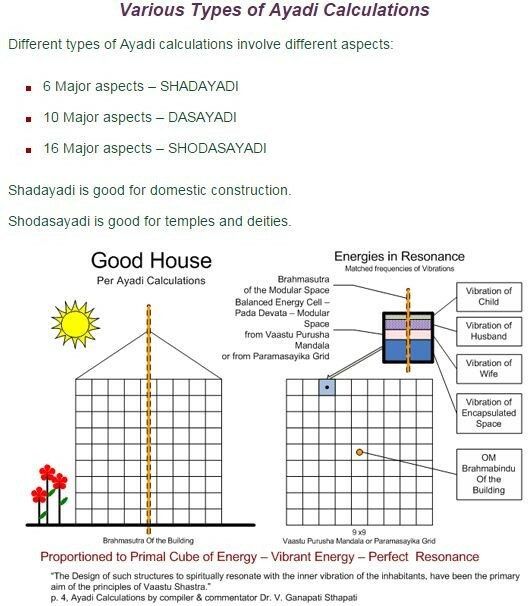 By having the dimensions worked out using the Ayadi formulae, the residents can, to a certain extent, experience material and spiritual awareness. 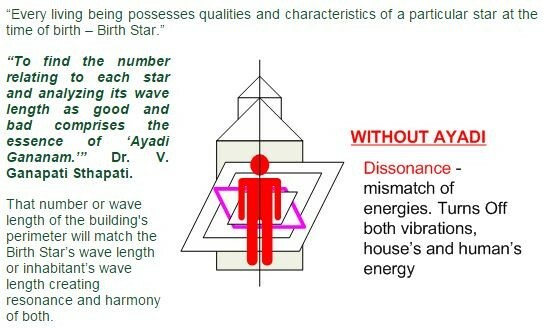 Living in such spaces can contribute harmony with the gross (sthoola) and subtle (sookshma) energies leading to both physical and metaphysical well being of the individual(s). 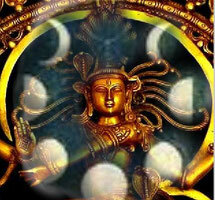 Aya, also known as aadhayam, means income and Vyaya means loss or expenditure. 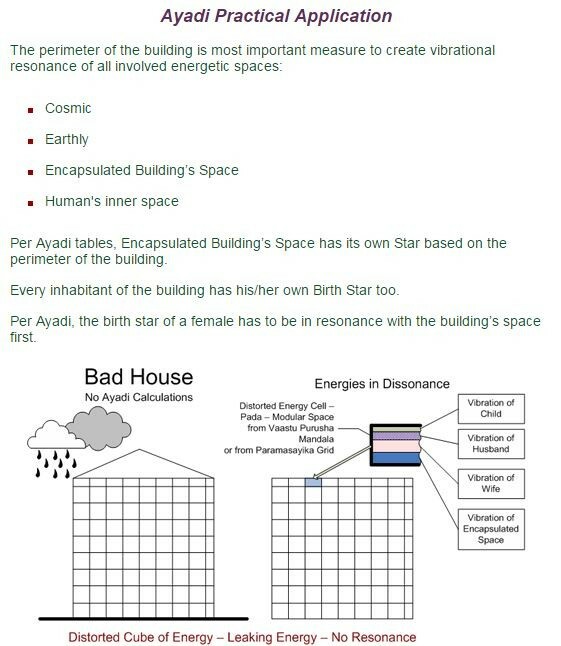 When these formulae are applied Aya should be greater than Vyaya (Ayam Adhikyam, Vyayam Hinam) in order that the dimensions worked out positively energizes the structure or building. 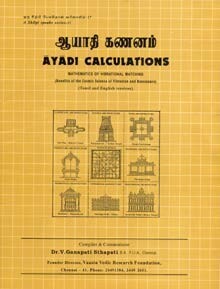 The Yoni and Rksha (Nakshatra) formulae are applied for finding the breadth of the building. The Yoni formula should be worked out to always get an odd remainder. 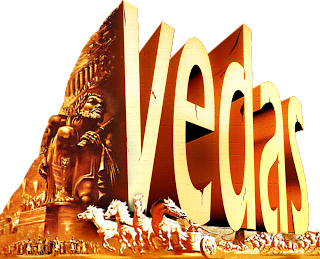 The 1, 3, 5 and 7 remainders are referred to as Dhwaja, Simha, Vrshabha and Gaja indicating the directions East, South, West and North, respectively. Generally orientation to any direction can have the Dhwaja Yoni worked out. The Yoni can be calculated, for sites not oriented to the cardinal directions, based on the following table. The Rksha (or Nakshatra) formula should be worked out such that the remainder indicates a constellation that is compatible to the master's (or spouse's) constellation. Consider a site measuring 45 feet by 63 feet. We first find the paisacha or non-habitable area by dividing each side into nine parts. On the 63 feet side, the paisacha works out to 7 feet each on either side giving us 49 feet of Vastu approved land for construction. On the other side of 45 feet, the non-habitable area works out to 5 feet on either side and we have 35 feet of Vastu compatible land for construction. 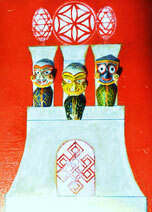 The Ayadi table given in the end of the article is worked out equating a hasta to 1.5 feet or 18'. 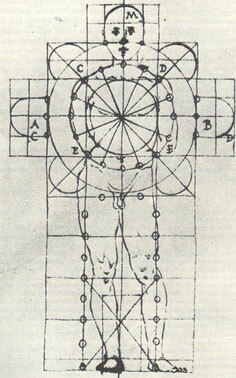 The formulae can be applied to both rooms (inner) and buildings (outer). Let us now look at the Aya and Rksha (E and F) columns to arrive at the proper length. Aya for 49 feet works out to 9 and Rksha works out to 18 (Jyeshta). 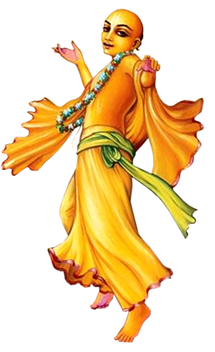 If we need a smaller measurement we can accordingly trace a dimension that gives higher figure of Aya and a compatible figure of Rksha. 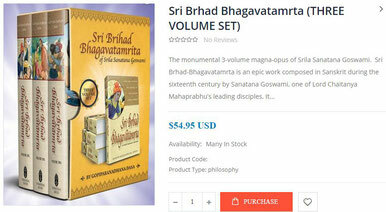 Divide the 27 constellations into three sets of nine each and count the nakshatra obtained from your nakshatra. The count as per following table indicates the compatibility or otherwise. Let us now arrive at the proper breadth dimension by referring to columns G and H. Locate the nearest measurement to 35 and check on its compatible Vyaya and Yoni. 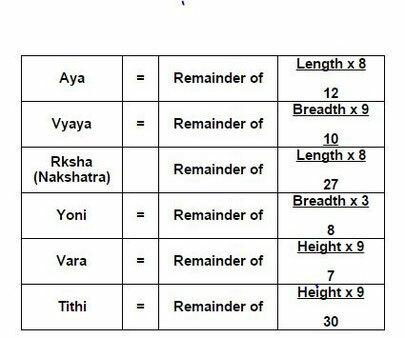 The table indicates dimensions 32.5 and 32.25 showing the Yoni as 1 and Vyaya as 5 & 4 respectively. On similar lines the height of the building can also be identified from the table. Where normal foundation is used, the height from its base can be considered and for pillar foundation, the height from the bottom of its base over which the building is constructed can be considered. The height is with reference to the highest point of the building be it the overhead tank or the skylight of the building. The columns to be referred to are I and J. The dimensions of length, breadth and height can be worked out for residential and business buildings, layouts, religious buildings, swimming pools and underground and overhead water tanks too. It would be indeed be a contribution to the people if city developers and builders allot sites to the public with the dimensions worked out on at least three formulae, viz., Aya, Vyaya and Yoni.